Developed exclusively for Mr. Green Casino by Net Entertainment (NetEnt), The Marvelous Mr. Green is a slot that celebrates everything green. Set against a beautiful backdrop of green, the reels feature icons of green things and golden high-value cards. The highlights are multipliers, free spins, and huge wins. To play The Marvelous Mr. Green, players have to choose as many or as few of its 20 paylines. They can bet up to 10 coins per active payline. Since the coin values range from $0.01 to $0.50, players can bet as little as $0.01 to as much as $100.00 per spin. The next step is to hit the Spin button, create winning combinations, and unlock the bonus features. Players can customize their gaming experience by turning on or off the audio effects and the ambience sound. They can also change the quality of the graphics and use keyboard shortcuts. Game history is also available to players who are betting real money on the game. Since NetEnt has developed The Marvelous Mr. Green slot exclusively for Mr. Green Casino, it is based on a theme of green. The reels feature icons of game logos, green cars, green airplane, green umbrellas, mansions, and bowler hats, to mention just a few. The high-value card icons are a beautiful gold set against a deep green backdrop, making The Marvelous Mr. Green one of the loveliest slots in the NetEnt portfolio. It honors almost everything green under the sun. The Marvelous Mr. Green Game Logo icon serves as the wild, which helps players complete winning combinations by substituting for all other icons on the reels except the scatters. A multiplier value in the range of x1 to x5 is assigned to players at random at the beginning of each spin of the reels. If players spin a winning combination, the payout for that combination will be multiplied by this random multiplier value. To unlock the free spins round, players need to hit a combination of at least two scatter icons anywhere on the reels. The number of scatters used to unlock this feature determines the multiplier value that players will receive. If players land 2, 3, 4, or 5 scatters on the reels, they will receive multiplier values of x2, x4, x25, or x100, respectively. When the free spins are being played, a multiplier meter appears at random on the fifth reel, multiplying winnings by up to six times. If the meter displays a stop sign instead of a multiplier value, the free spins round comes to an end and players will be taken back to the base game. 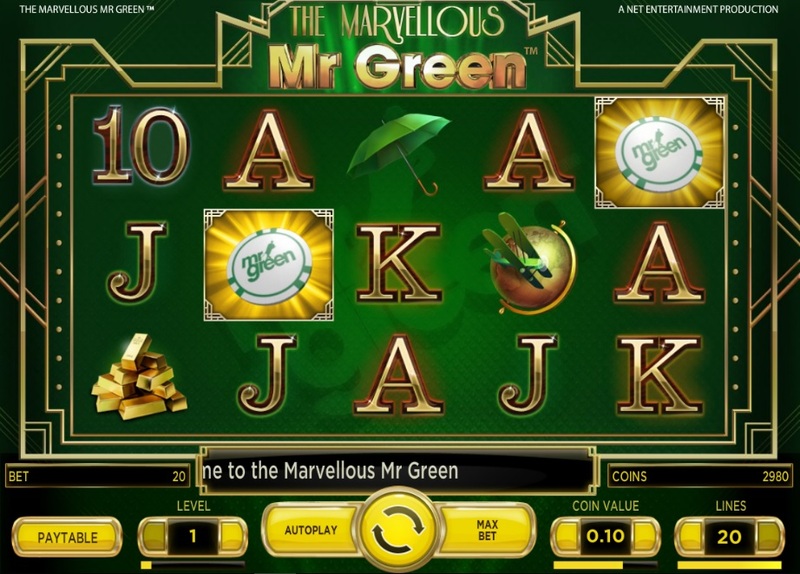 With its unique theme and attractive random multipliers, The Marvelous Mr. Green is one NetEnt slot that must not be missed.